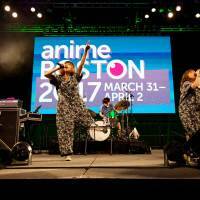 “Retro” was the theme at this year’s Anime Boston, the largest anime convention in the Northeastern United States, and that idea extended to the event’s featured musical acts: veteran pop duo Puffy AmiYumi and 1960s-styled rock quartet Okamoto’s. You can usually find Okamoto’s playing top-tier venues in Tokyo. Seeing their name on the roster of an anime convention came as a bit of a surprise, but it shows just how much broader the world of anime soundtracks has become. Anime soundtracks used to travel poorly, with Western fans dismissing the melodramatic scores and lyrics. Songs for TV in particular were often composed to appeal to Japan’s karaoke-driven demographic: Fans would memorize every word and melodic cadence so they could replicate the vocals with friends in an intimate karaoke room. These days, however, soundtracks are becoming integral to an anime’s overseas appeal. Radwimps, the band that scored Makoto Shinkai’s recent mega-hit “Your Name.,” re-recorded that film’s soundtrack with English lyrics for its Stateside release on April 7. The film is now the highest-grossing anime of all time and Radwimps played a key part. Puffy AmiYumi, two former idoru (girl idols) now in their 40s, continues to cater to an expanding fan base of anime devotees through soundtrack appearances. Her partner, Yumi Yoshimura, adds that anime fans outside of Japan are becoming more accepting of the country’s rock music. “I don’t think it’s a change in the anime industry in Japan. It’s that fans overseas are giving us a chance to participate in the media they love,” she says. 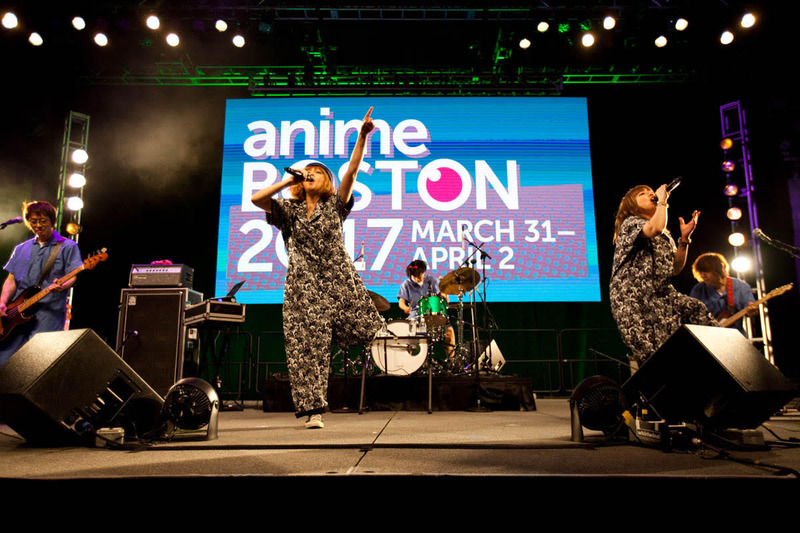 Decked out in pajama-like onesies, Puffy AmiYumi played a set at Anime Boston that was more raucous guitar rock than conventional J-pop, wowing the packed 3,200-seat Hynes Convention Center, whose crowd included as many teenagers as kids with parents in tow. This is the duo who inspired the Cartoon Network’s hit series “Hi Hi Puffy AmiYumi,” and who sang the opening theme to another popular series, “Teen Titans.” As the crowd roared around me, I felt like I was at a Rihanna concert … without any of the sexual innuendo. I first wrote about Puffy AmiYumi when the pair performed at the 2005 Macy’s Thanksgiving Day Parade, a major TV event on the American calendar. It was an impressive feat for a Japanese act, and today Onuki and Yoshimura say U.S. audiences are even more open to foreign music and fashion. I saw evidence of this openness at last month’s Naka-Kon, the largest Japanese anime convention in Middle America. It felt like an oasis of global pop culture at the center of the continent. At my hotel, fans gathered in the lobby the night before Naka-Kon opened, cosplaying and indulging in a culture whose language, ideas, attitudes and media are thousands of kilometers away. The chief musical act at the event was a neo-gothic five-piece called RondonRats. They wore makeup, at times imitated the Smiths, and thrashed joyfully across the stage before an adoring crowd. The scenes that played out at Anime Boston and Naka-Kon are being echoed at conventions across the United States and Europe, and the bands that play these events fulfill a Western desire to see and hear a genuinely foreign take on culture. It’s an experience that’s difficult to get when filtered through Western institutions, and Hollywood’s failure with the recent “Ghost in the Shell” reboot may be indicative of that. “I think one important reason to have (authentic) music performances (at the conventions) is providing that opportunity for the musicians and attendees to connect directly,” Inoue says. Uniting with anime also gives Japanese musicians a new channel to present themselves to potential fans. “It’s one thing for attendees to hear the music via the internet or CD, but I think they obtain a more genuine appreciation of the artist when they take time out of their busy schedule to come all the way to Kansas to perform,” Inoue adds. While conventions are definitely closer to the Japanese pop culture experience, nothing quite beats heading to the country yourself.